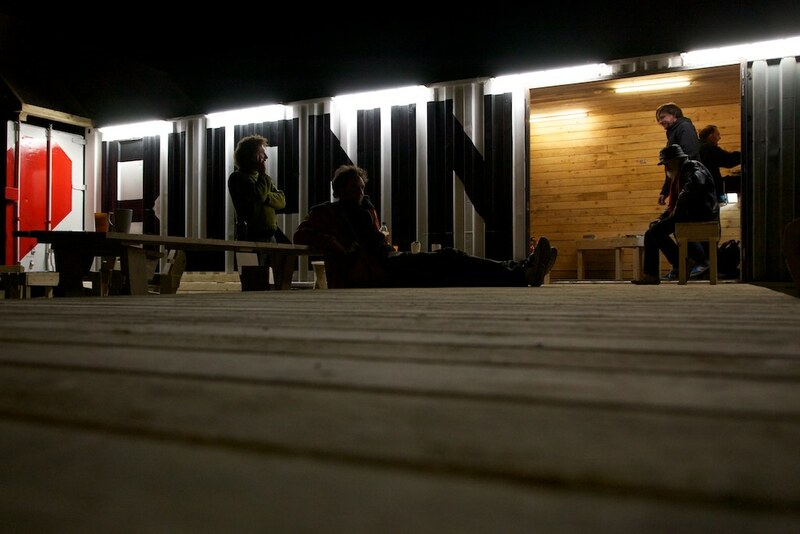 As the headline project of Fierce Festival 2011, EXYZT presented Burningham, a multi-functional space for gathering, exchange, conversation and eating. Burningham is an installation designed and constructed by the acclaimed architectural collective EXYZT. The site lives in the shadows of Birmingham’s abandoned Curzon railway station and is destined to be on the route of the proposed HS2 high speed rail link. 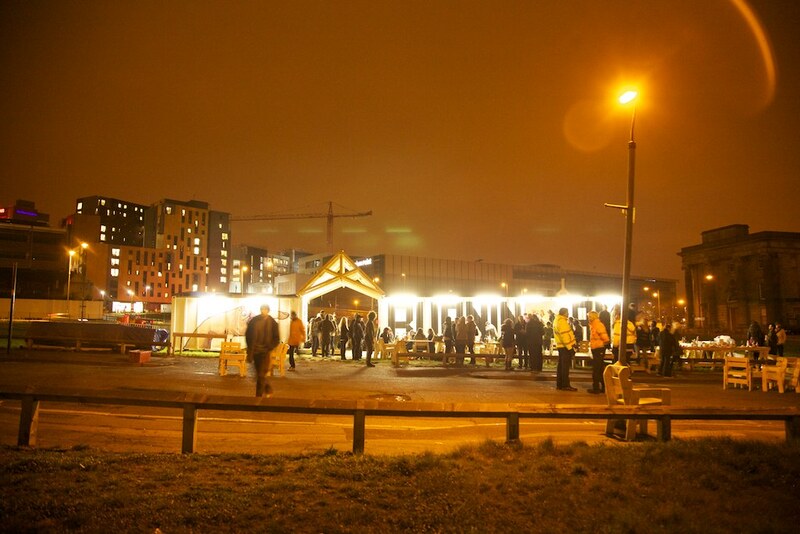 A consortium of events are planned to take place on Eastside Green between 19th – 21st April 2011 to bid farewell to the site which has hosted EXYZT’s introduction to Birmingham. Eastside Green is located off New Canal Street, opposite Millennium Point in Birmingham. All events are FREE and information can be found below. MAX/MSP, VVVV, PD, Quartz Composer: Node based creation tools for a new generation of artist. Long used by artists to trigger installation pieces in galleries, these pc based junction boxes have transcended their initial intentions for the musical tweaker. Now boasting slicker interfaces and control of the raw computer hardware these multimedia engines have become a medium in their own right, letting non programmers get to grips with the digital synthesis of noise and colour on a visual level. Becoming ubiquitous with audio visual tweakery these programs can be used for closely linking sound and vision at a low level, resulting in unique and often stunning form and rhythm. Local artists Laternist, Hello Cat Food, Chromatouch and Minuek have been experimenting with these tools for long enough to start performing, and this will be the first live performance using these tools as a collective. ‘At the Ride In’ has been set up in collaboration Community Interest Group Nimble. Nimble aim to promote the arts and environmentally friendly activities (such as cycling) to a wider audience and to communities that aren’t usually aware of what’s available to them. They believe that everyone and anyone should feel a part of their local Art’s scene and aim to get more people cycling in Birmingham. “At The Ride In” will be an evening of films, talks and informal workshops promoting alternative transport in a fun way to the wider community in Birmingham. 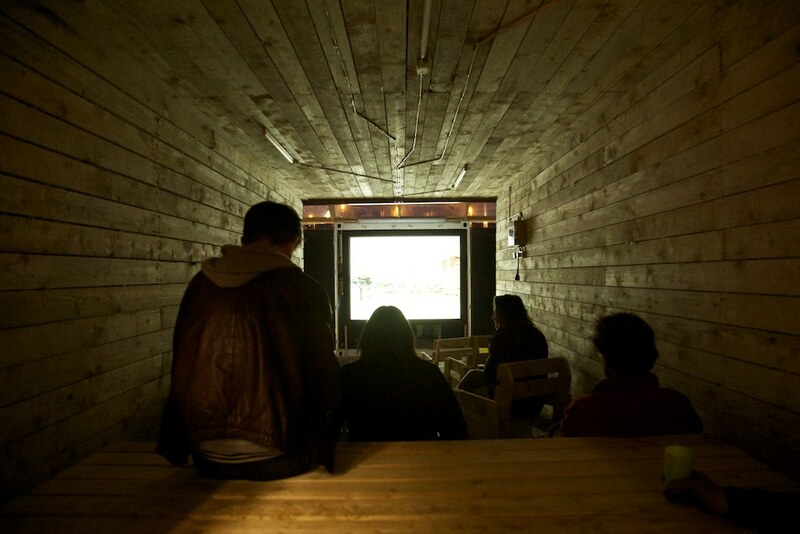 The EXYZT site provided inspiration for a cycle-thru cinema whereby an informal setting and fully accessible screening at the EXYZT containers will make people feel welcome to drop in and out. The screenings will take place in two halves, with one set of screenings at 5-7pm and the second at 7.30 – 9.30pm. The official film list is not confirmed but will possibly include; Bike Kill, Copenhagen Cycles, Vive Le Tour, Rapha and Ridley Scott Associates films and Red Light Divide. However the official film list with Directors and running times will be available at the event. To find the answer to what burns in the heart of Birmingham’s soul, we’ve turned to those responsible for providing the dashes of colour on its grey expanse. Normally hidden in the cracks of the city, for one night they will emerge to perform together, as they reveal how Birmingham inspires them to illustrate it. This event considers EXYZT’s observations to support their process of ‘urban psychoanalysis’. Does Birmingham have a multiple personality disorder? Does the city have low self-esteem? In fact, what does actually burn in the heart of Burningham? Three of Birmingham’s biggest street artists compete and combine to create their own answers to what is Burningham. Tempo and As1, stalwarts of the Birmingham street scene, will battle one another as they seek answers to what ‘burns’ in Birmingham’s soul. AS1 draws on the city’s Anglo Saxon heritage to create a piece that embraces the city’s damaged façade and warns those who attempt to change it of the peril they face. Tempo will use the symbols of the street to create a representation of the true face of the city. Scraping beneath the sanitised front of the city, he curates the all aspects of the street scene into one place. Paste artist, Lisk, rising star of the local scene and famed for his robots scattered across the city will compose a large scale paste of his robots finally completing their invasion of the city. Exploring concepts of identity and the masses of a city, Lisk pulls at the threads that hold the city together. Using the defining colours of the Burningham project, each artist will create a lasting representation of what Birmingham is and how it is portrayed. Sound tracked by their favourite music, and incorporating audio visual projections the artists are free to paint on Birmingham in a way that is at last free and intends to remain a evolutionary place for new works to occur. Taking place on the industrial shipping containers that form EXYZT, this is street art, taking place in a street gallery. On the 26th April the EXYZT container shall be lifted into the sky and relocated onto higher ground opposite the Nikal Masshouse residential development on Moor Street Ringway in Birmingham. This highly visible location in Birmingham City Centre shall enable EXYZT to continue their explorations to identify what does actually burn in the heart of Birmingham. We invite you all to join them on this evolutionary journey that shall continue throughout 2011.